Join ASWIFTT RADIO Host Brenda Johnson Padgitt June 8, 2013 at 1 pm CST, 2 pm EST and 11 am PST as she interviews Author Wendy Oliveras who wrote the book “Let’s Play SHESS.” Wendy will discuss how to use strategic SHESS SKILLS to win in Life. The book was written to inspire women of all ages and backgrounds. 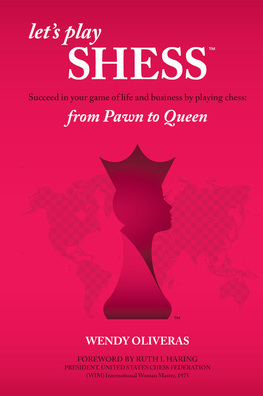 She wants women to aspire to go from PAWN to QUEEN and succeed in the game of life and business by playing chess. Wendy says she wants to start the dialog and send the message that our little girls and women should not be afraid or intimidated by playing chess, but use chess as a foundation to develop their intellectual weapontry, set and accomplish goals and believe in their abilities. The rewards and benefits are just too important to ignore. Tune in to online to ASWIFTT RADIO on June 8, 2013 at 1 pm CST, 2 pm EST and 11 am PST at http://www.blogtalkradio.com/aswifttradio to listen to the discussion with Wendy Oliveras about Using Strategic Shess Skills To Win In Life. For more information about this show contact ASWIFTT RADIO Host Brenda Johnson Padgitt at 1-800-775-2708 ext. 3060 or e-mail: news@aswifttradio.net. ASWIFTT RADIO Is Back For Another Quarter!